If you're doing a quick trial of Yammer, you can experiment with the Yammer settings, add some users, and go. Go to the Yammer admin center. Click the links in the New Network Checklist to get started. You can also click Start Here to go to the Yammer Success Site, your resource library for product training, IT integration guides, and community tips to engage your network. Get an overview of key concepts and first steps to setting up your Yammer network with Yammer admin key concepts. 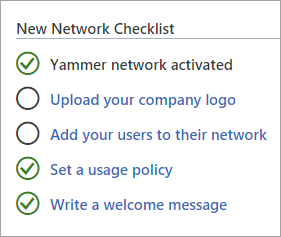 For links to everything you need to administer your network, see Yammer admin help.